A supremely rich, soft facial moisturizer to deeply nourish, repair and protect the skin. ...NUTRITIONNELLE instantly banishes tightness and discomfort, leaving the skin supple, smooth and visibly plumped. 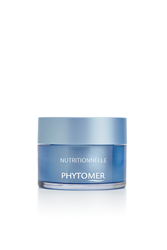 Phytomer introduces NUTRITIONNELLE Dry Skin Rescue Cream to bring comfort, hydration and protection to even the driest skin. This soft, rich cream replenishes the skin’s lipid content with a quartet of marine and plant oils, restoring moisture and guarding against dehydration. Ceramides and Phytomer exclusive ingredient HYDRAFUSION® reinforce the skin’s barrier function, locking in moisture and protecting the skin in any climate - be it hot or cold, arid or humid. Enriched with shea butter for added softness, NUTRITIONNELLE instantly banishes tightness and discomfort, leaving the skin supple, smooth and visibly plumped. It has a fresh, delicate scent with notes of jasmine and rose and leaves a lightweight, velvet-soft finish to pamper the skin from morning to night. Directions for use: Apply morning and evening to perfectly cleansed face and neck. Suitable for dry to very dry skin. Dictyopteris Oil - derived from brown algae. Promotes the synthesis and transport of lipids. Glasswort Oil - hydra-replenishing. Boosts the synthesis of urea and reinforces the skin’s lipid barrier. Buckwheat Oil - anti-water-loss. Enhances the skin’s intercellular cement. Apricot Kernel Oil - reinforces the skin’s hydrolipidic film and improves its barrier function. HYDRAFUSION® - concentrated extract derived from red algae. Boosts hydration and plumps the skin with instant moisture. Maintains moisture long-term and in any weather conditions. Ceramides - restore the skin’s barrier function by filling in gaps in the skin’s structure. With over 40 years as the leader in the marine skin care, Phytomer is now a pioneer in the field of marine biotechnology, the future of results-oriented cosmetics. This is the newest technology to create innovative, 100% natural skin care ingredients. Based in Saint-Malo, France and distributed in 70 countries worldwide, Phytomer has a reputation of leadership and expertise within the spa industry. With Phytomer meaning “plant of the sea,” we utilize seawater, seaweed or seaside plants in every retail and professional product, combining science with the natural powers of the sea. We are one of the only spa brands with our own laboratory, allowing us to research and cultivate our own ingredients, develop unique cosmetic formulas, manufacture skin care products and create cutting-edge professional treatments to deliver remarkable results.